Pen and Paper: (WICCA/SWEEP #4): DARK MAGICK. DARK MAGICK BY CATE TIERNAN. The council pronounced me not guilty of killing Linden. Our foreheads touched; our faces were turned to fire. I took a deep breath, closed my eyes, and let myself drift into meditation. SOURCE ... Received from a friend. 7 of 12 books read for my Mount TBR 2018 challenge. Whilst I'm sure some poetic licence has been used in the writing of this, I can testify that at least the festivals mentioned are correct. Other than that, I'm not qualified enough to even begin to go into whether or not your average young Wiccan/Pagan will identify with any of the characters/events portrayed let alone whether the author got these spot on (or horribly wrong). Of whether or not the average reader of the series (a series which by the way I have only just now joined) particularly cares about this or is just happy to see someone who they can even slightly identify with featured in a novel. In many ways your typical YA novel (though technically, at less than 200 pages, more of a novella) in that a somewhat naive teen meets and 'falls in love' with a handsome teen who may or may not be all they seem. The said naive teen's other nemesis? Several others (who shall remain un-named for fear of any spoilers) who, likewise, may or may not be all they seem. The story of young Wiccans, Morgan and Cal. 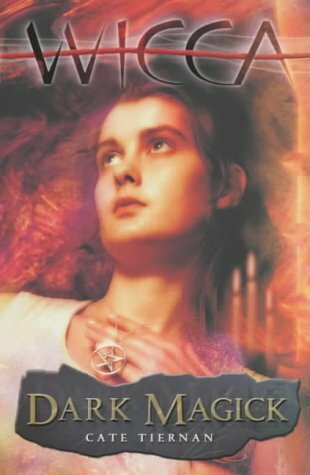 To me (bearing in mind I haven't read the first three books in the series though this is something I plan to remedy) Dark Magick is firstly and foremostly a story of discovery; of a young woman discovering herself;her legacy; her strengths and weaknesses;who she can trust and who she can't. A tad repetitive, hair being stroked; 'whitish blond hair'; 'short sunlight-colored hair'; 'shiny hair' (the list goes on) ... just what is it with the author's obsession with hair? Then there are the Book Of Shadows entries. Written in italics so not necessarily the easiest to read (I know I struggled). I found these entries a distraction to begin with, the fact that they were from two different perspectives (present day and historical) a wee bit confusing though, having said that, the historical thread certainly filled in some of the back-story that I was obviously missing. As for the pacing. Not the best - I admit that, on occasion, I found myself feeling thankful the book wasn't any longer. Difficult to pinpoint why exactly but essentially enjoyable. I guess it says a lot that I did initially question whether or not I'd carry on with the series. However, come the end of this, the fourth book, more than intrigued, I KNEW that not only had I to learn what was in store for Morgan but I had to start at the beginning and learn just what had transpired previously. Hmm... well I'm afraid this just doesn't appeal to me, in part because it jumps right in at book 4 (and you know I'm normally a stickler about that). I'm glad, despite all the negatives, that you enjoyed it and want to continue on (as well as go back and catch up). A person slowly develop powers seems like an interesting concept. As you describe it, the poor writing might be very annoying however. I would read the series in order. Tracy, I'm glad that you found this book to be essentially enjoyable. Dark Magick sounds like part of a compelling series. at the beginning of the aeriea.